Be the first to share your favorite memory, photo or story of Carlos . This memorial page is dedicated for family, friends and future generations to celebrate the life of their loved one. 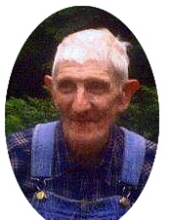 Carlos “Jay” Markwell, age 82, of Bullfork Road, Morehead, passed away Saturday, February 2, 2019, at his residence. Born October 12, 1936, in Rowan County, he was a son of the late Emmit Denver Markwell and Francis Curtis Markwell. Besides his parents, he was preceded in death by a sister, Lillian Markwell, and a brother, Earnest Markwell. Jay is survived by longtime friend and caregiver, Clela Markwell (widow of Ivan Markwell) of Morehead, cousins, and friends. Carlos loved life at home fixing things and was known as a good small engine repairman. He lived a very simple life and loved his many cats, friends, and neighbors. He will be missed by all who knew him. Funeral services will be conducted 2 p.m. Tuesday, February 5, 2019, at Northcutt & Son Home for Funerals Memorial Chapel with Pastor Jared DeAtley officiating. Burial will follow in Markwell Cemetery on Bullfork Road, where Jay will join the rest of his family. Pallbearers: Orville Little, John Little, Joe Carter, Danny Hamilton, Mike Knipp, and Danny Caudill. Visitation will be 5 p.m. to 8 p.m. Monday, February 4, 2019, at Northcutt & Son Home for Funerals in Morehead. To send flowers or a remembrance gift to the family of Carlos "Jay" Markwell, please visit our Tribute Store. "Email Address" would like to share the life celebration of Carlos "Jay" Markwell. Click on the "link" to go to share a favorite memory or leave a condolence message for the family.